The Week in iPad Cases: The iPad 2 cometh! The launch of the iPad 2 brings with it the expected onslaught of new accessories—including, of course, plenty of cases. It's thus fitting that this installment of our iPad case roundups is dominated by protection for Apple's newest device. Case Closed: Case Closed specializes in sleeves made with German Wool Felt—they look fuzzy and keep your device cozy. For the iPad 2, the company sells a basic one-color (charcoal or grey) model for £26 and a dual-color (charcoal and orange) model for £33. For £3 more, you can opt to add elastic closure straps. The company also offers, at the same prices, versions of these sleeves that accommodate an iPad 2 with Apple's iPad Smart Cover. CrystalRoc's Swarowski—4,000 crystals make one awesome disco ball. 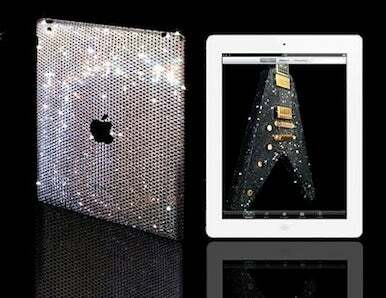 CrystalRoc: You may want to put on a pair of sunglasses before you check out the Swarovski for iPad 2, which covers the back of your tablet with a whopping 4,000 Xillion crystals from the fabled glassmaker. The $700 covering is available in three colors: crystal, jet hematite, or rose. Hard Candy Cases: The Bubble Sleeve ($50; iPad & iPad 2) comes in black, "gold green," or pink and combines a rigid, EVA-molded case with a number of bubble-shaped shock absorbers that help protect the iPad from unwanted bumps. The StreetSkin ($40; iPad 2) is a thin, rubber skin that protects without adding too much bulk. It also incorporates magnets that, as with Apple's Smart Cover, automatically put the iPad 2 to sleep and wake it up when you close and open the case, respectively. The CandyConvertible ($45; iPad 2) is a folio-style case made of animal-friendly faux-nubuck material and available in red or black. iKit: The Carbon Case ($30; iPad 2) combines durable rubber and polycarbonate together in a snap-on case that provides both style and protection. The rubber-molded sides ensure a safe grip. Marware: The Eco-Flip case ($55; iPad 2) aims for versatility: It's a case that flips open like an old-style notepad; it's a stand; it's a typing platform; and it's a wraparound strap that lets you hold your iPad comfortably in your hand. More than that, it's made of environmentally-conscious leather. The Eco-Flip is available for pre-order on Marware's Website. Nedrelow's Sleeve. Doesn't it look cozy? 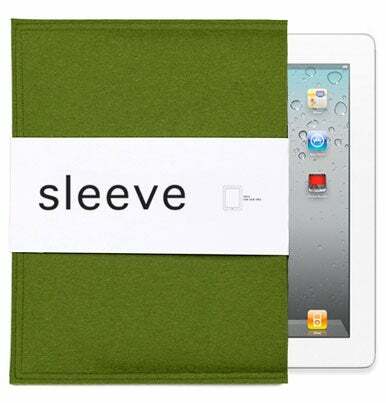 Nedrelow: If you like sleeves, this company is introducing the Sleeve for iPad 2 ($39). You get your choice of a vertical- or horizontal-loading orientation, as well as support for either a bare iPad 2 or one wearing Apple's Smart Cover. The handmade Sleeve is available in charcoal, forest green, or natural brown and will start shipping on March 16. Nextware: Calgary-based manufacturer Nextware (Website currently undergoing renovation) is aiming for simplicity and style with two new iPad 2 covers. The Foliobook ($45), available in tweed or faux-leather, has a soft, microfiber interior and doubles as an adjustable-height stand. The Carbon Clip ($35) is a snap-on, hardshell case that provides excellent protection while leaving all the important parts of your iPad readily accessible. The cases are slated for a late-March release. XtremeMac: XtremeMac's Tuffwrap Shine (iPad 2) is a soft, snap-on case available in three different styles. The Shine provides protection without adding too much bulk and comes in honeysuckle pink, transparent, or black. If you're looking for the thinnest possible case, the Microshield (iPad 2) is a rigid plastic case that provides extra grip and comes in frosted-finish black, blue, or purple. For the more style-conscious, XtremeMac also offers the Thin Sleeve (iPad & iPad 2), which sports a durable exterior and a soft, microsuede interior to keep your iPad safe and sound. The Sleeve also features a unique "eject tab," to help you pull out your iPad, and a magnetic closure. Prices are not yet available for any of these new models, but the cases will be available for order from the company's Website on March 11. Zagg: The makers of the popular InvisibleShield protective films are at it again with versions designed specifically for the iPad 2. The films are available for pre-order for $30 to $40, depending on how much of the tablet you want to protect, and come with a 45-day money-back guarantee. 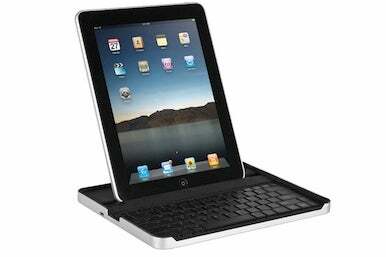 Zagg has also announced an iPad 2-compatible version ($100) of the company's ZaggMate Case with Keyboard, which combines an aircraft-grade aluminium shell for the front and sides of the iPad with a Bluetooth keyboard. The new Zaggmate is also available for pre-order.